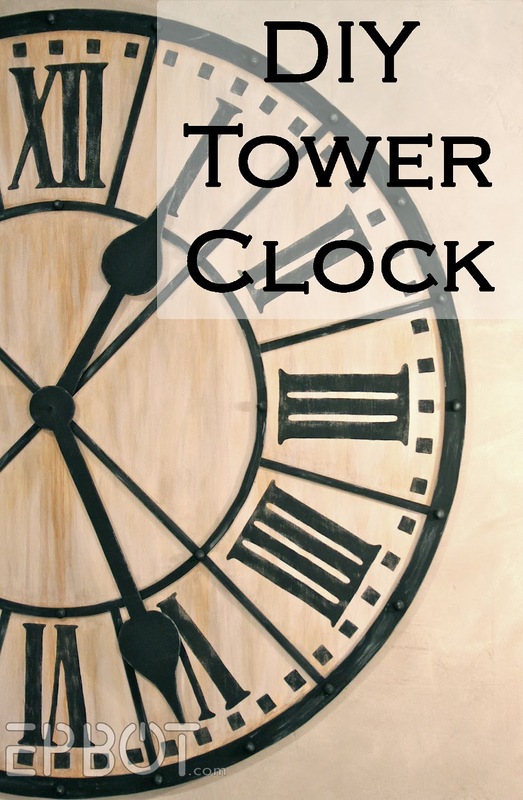 And when I say giant, I mean..
For my sabbatical John and I completely gutted and remodeled our bedroom, and one of the key elements I was after was a vintage Tower Clock. I wanted that style up there, but not nearly as distressed. I searched high and low online, but everything I found was too small - averaging about 30 inches - and even those were hundreds of dollars. You know where this is going, of course. We decided to make our own! Happily the material cost for this project is next to nothing; all you need is plywood or Masonite, paint, paper, adhesive, and time. 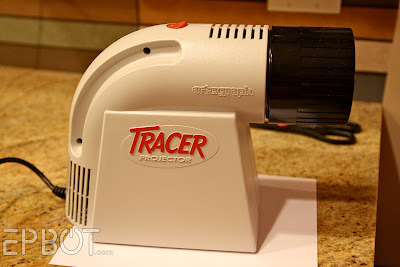 The tools are a bit trickier, since you'll need a projector and both a jigsaw and a miter saw, but you should be able to rent the tools and maybe borrow the projector, if you don't already have them in the garage. Use painter's tape to secure it, since it'll want to tip. You don't have to print the graphic very large; less than half the size of a sheet of paper will do. Getting the projection perfectly aligned and centered is tricky - ours ended up being just slightly off - so take your time and make sure it's as perfect as possible. Now trace it all out with a pencil, and then get comfy in front of the TV and paint those numbers in! The paper should be thin enough to allow you to see your numbers, so you can draw your lines and circles around them to fit. 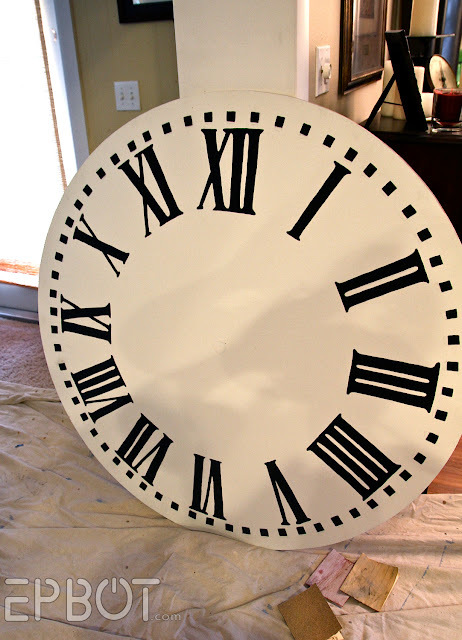 To get your circles perfect, stick a small nail or thumbtack in the exact center of your clock face, and then tie a long piece of dental floss or string around it. Tie the other end of your floss around a pencil - making sure the length is correct - and trace away! Once your outside edge and inner circle are done, use a ruler to draw in all the straight lines between the numbers and criss-crossing through the center. 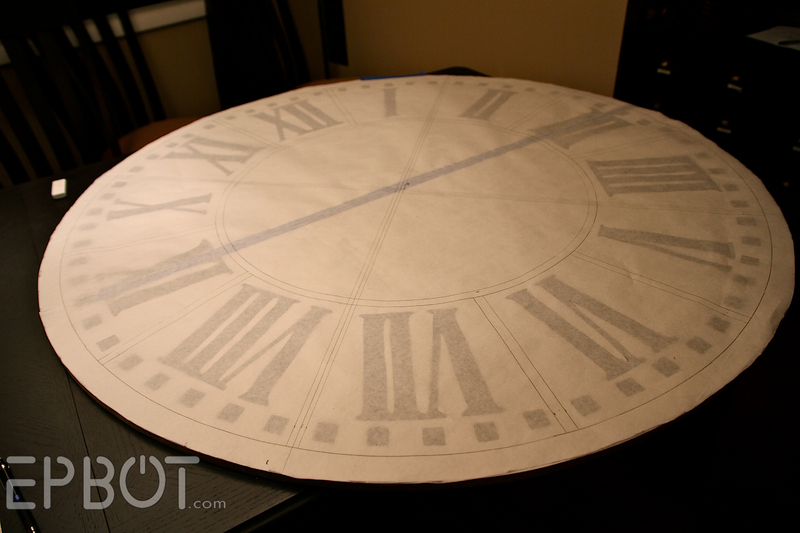 Once everything is cut and fitted properly, it's a good idea to number your pieces on the back and on the paper, so they don't get mixed up later. Anyone else seeing the cockpit of the Millennium Falcon here? Just me? Now start sanding through your painted numbers vertically - and ONLY vertically. Keep going 'til it's as distressed as you like. I was going for pretty subtle, but you could keep sanding 'til the numbers are barely visible, if you like. LOOK AT ALL THAT GLORIOUS GRIME. 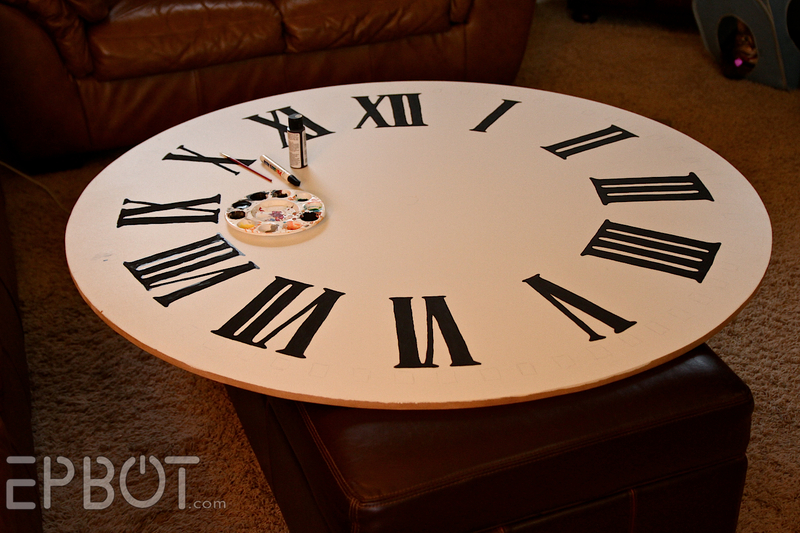 When your clock face dries again, grab a satin or matte clear spray paint and give it a nice even coating. Now your "dirt" is sealed in, no glaze or extra paint required! Assemble all your pieces first to test the fit, and then glue everything down with E-6000 or construction adhesive. You'll need two pairs of hands when placing those circles, btw; they're flimsy and could easily crack if you pick them up from one side. 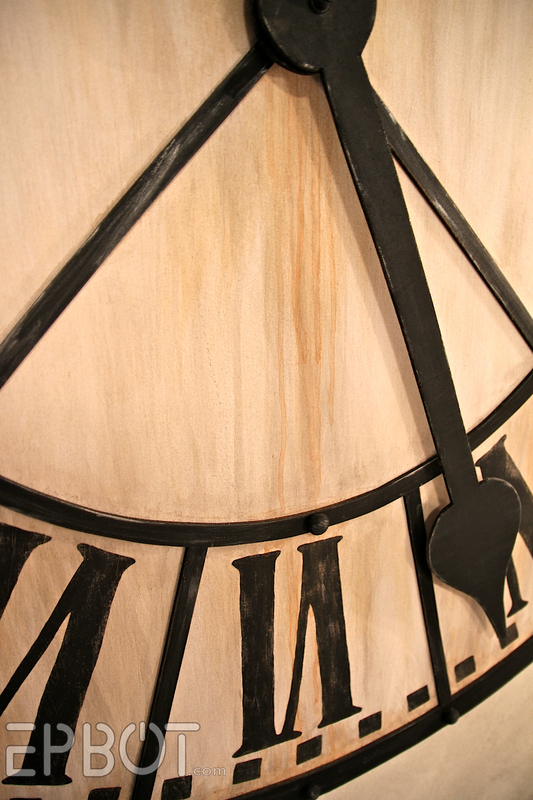 Once everything's glued and dried, go prop your clock against the wall again, 'cuz it's time for MORE grimy fun! You can see my sample board there on the floor; I experimented with a few different colors of watered down craft paint, finally settling on a base coat of a brownish gray (already applied here), followed by an orange rusty top coat that I allowed to drip from the top and center cross section. It's fairly subtle, but gives a nice feeling of age the closer you get to it. These are optional, of course, but I think give it that extra nice 3D touch. To age the black grid and make the rivets stand out, I dry-brushed on a tiny bit of silver paint to the peaks and edges. All that's missing are the clock hands! 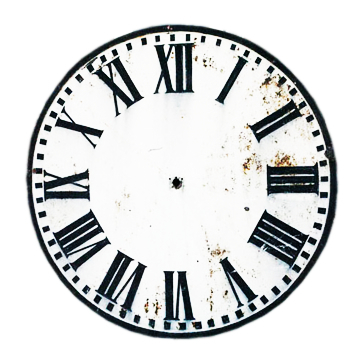 We briefly considered making this a working clock, but I didn't want the hassle or the noise of a ticking clock in the bedroom. Instead we just screwed the hands in place, with a spacer in between so they'd stand out a bit from the face. The concept is simple, but this is a fun project with a big, BIG impact. Hope you liked it! I have one or two more tutorials from our room to write up before I show you the Big Reveal, but I think you're realllly going to like the antiqued mirror panels we made. 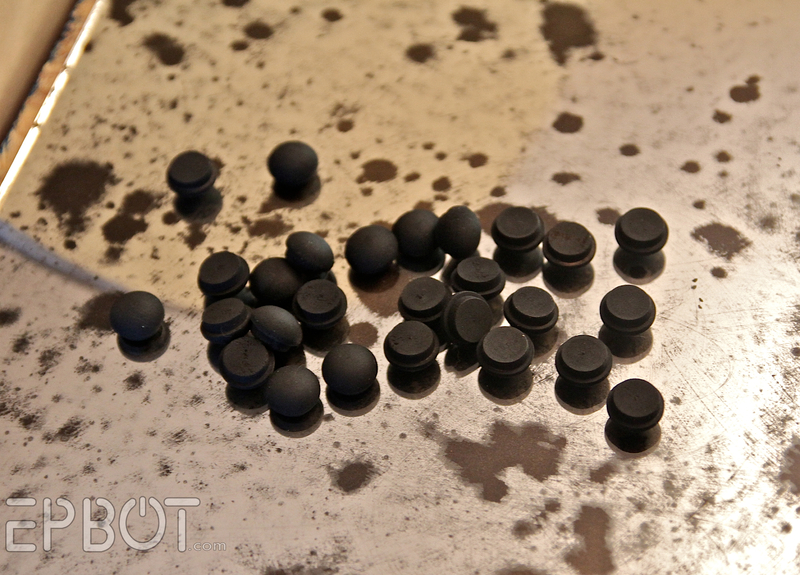 (There was a sneak peak in my "rivets" shot.) Stay tuned for those! This is pretty cool, but a thought comes to mind of an easier way to make sure your numbers are centered. Assuming you're going to be cutting out your circle, why not trace the numbers first and then cut it out? Sure, that'd work! It's not just centering, though; if the projector is tilted even slightly it can warp the projection, which is what happened to us. That can make one side a bit larger or otherwise "off." Just something to watch out for! This is fantastic. I'm so happy you're back at Epbot. This is gorgeous! I've also been looking at large clocks for a while. The one I really want though is the one in King Jareth's castle with the dagger hands. Looks like I have yet another project on the to-do list! So amazing! One of my favorite projects you've done. You don't necessarily need electrical skills; just a clock mechanism butch enough to support the hands. There's one at the local craft stores that comes with 20 inch hands I think it is (plus wall decals) - not quite large enough for this size, but workable if you try something smaller! But how did you decide what time to set the hands at? Can you change them? Maybe reset them with a note for a really huge reminder to yourself? I was wondering how they decided what time to make it too! I hope it's something cute like the time of day Jen and John first met or the time they got married or something. Awesome! Love it! Great job! Just in case anyone else is curious why the 4 is represented by IIII instead of IV, go to Wikipedia and search for "Roman numerals." Scroll almost all the way to the bottom of the page and look at the last section titled "IIII on clocks." The last two bullet points there especially made me say, "Cooo-ooool!" 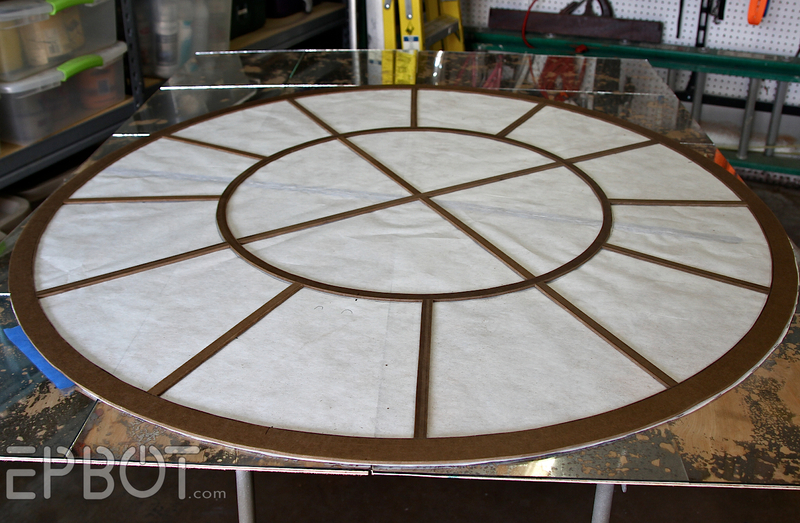 There's also a sneak-peek of the antiqued mirror panels in the first photo of the Masonite grid (pre-paint), you tease! Eeeeee! Excited to see the rest! You built a CLOCK. You are ridiculously amazing. Your creativity and skill never cease to amaze me! I would be interested in making a thing like that work. Wonder if a basic craft shop clock mechanism would be strong enough or if you'd need something more powerful to move those arms? 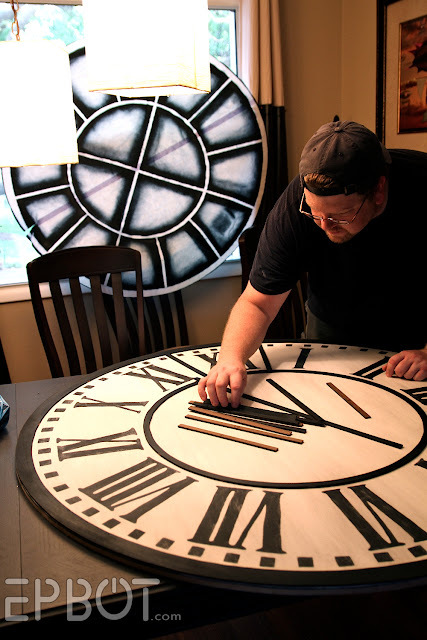 Sure, you could try lightening the hands by making them out of craft board - the kind with foam in the middle - and then the largest battery-powered clock mechanisms should be able to handle the weight, no problem! I've moved into a new flat and I was planning on painting a massive clock on my wall. Now I'm going to have to do something more dimensional. Damn you for being so creative and inspirational! I'm a paper crafter, so it's going to be interesting to see how I figure this one out. Thank you for being so creative and inspirational. That's an awesome looking clock. It'll have to go on my things-I-want-if-I-ever-own-a-house list. Love! Also slightly jealous. But mostly LOVE! 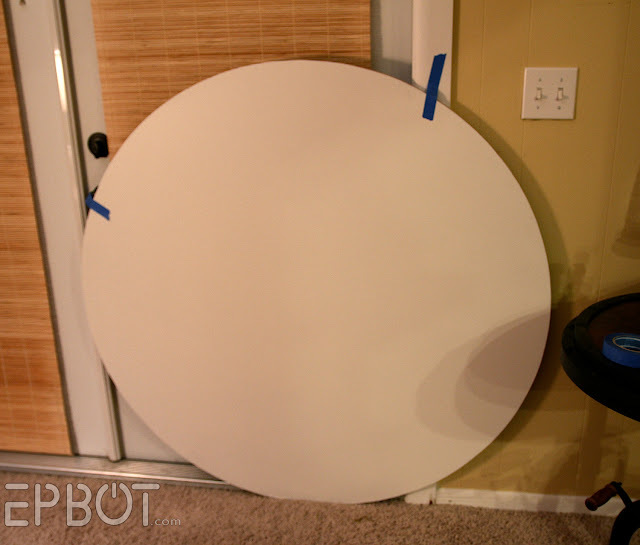 I was like, "How do you blow that pattern up to fit a 48 inch circle? That'll take, like 20 sheets of printer paper...OH. Use the projector. GENIUS!" Speaking of clockwork, I'm currently working on a clockwork droid Halloween costume (from Doctor Who's "Girl in the Fireplace"). I started with a plain white mask from Michael's and a $10 bridesmaid's dress from Goodwill. I'll have to kind of gut the dress, which I've never done before. I'm kind of nervous about how it'll turn out, but I've got a lot of ideas on how to make it work. AMEN to that! And please share pics of your droid over on FB when you're done - I'd love to see! That is too cool. I know you've done reveals for different rooms of your house but I'd love to see a full walkthrough of all the awesomess you guys have used (or DIYed) to decorate (especially the "nerdy" stuff). Though I suppose the Christmas decorations post you did gives a pretty good idea. I ADORE your DIY posts, DROOL at your ability to bring your visions to life and am eternally GRATEFUL that you choose to share your creative genius with us. You INSPIRE me!! I think you both are actually wizards. Wow. Wow, you two dont cease to amaze me! That clock looks great. Especially the rusty streaks make it look very authentic old. If you ever want to give us a tour through your workroom with all your cool powertools and stuff, I will be overjoyed. Thanks so much for sharing. I love your DIY-Posts! I love your DIY/Make It Work heart!! There is such satisfaction when you do something yourself. After purchasing my home, I knew I had to furnish it on the cheap since it's just me paying the bills. I went to thrift stores, Salvation Army, Goodwill and picked up pieces to put in the house. I also haunt Craigslist from time to time. I have recovered chairs for a fraction of the cost of buying new ones, re-purposed hand-me-downs, and refinished several dressers and chests of drawers. I get a huge thrill out of saying "I did that". I also like that my rooms aren't magazine perfect. My home looks collected and eclectic with a mix of vintage, antique, and quirk. Thanks for sharing!! Ooooh, pretty! I have always wanted a really big clock in my living room. This gives me some great ideas. :) Thank you! The thing that would push this clock to epic status would be a little mini Doc Brown hanging from the minute hand. Otherwise, it is simply beautiful! You guys are simply amazing! I wish you guys could fix up my décor! I am SO not good at that type of thing. Your creativity + John's master craftsmanship= PURE GENIUS! Bravo! 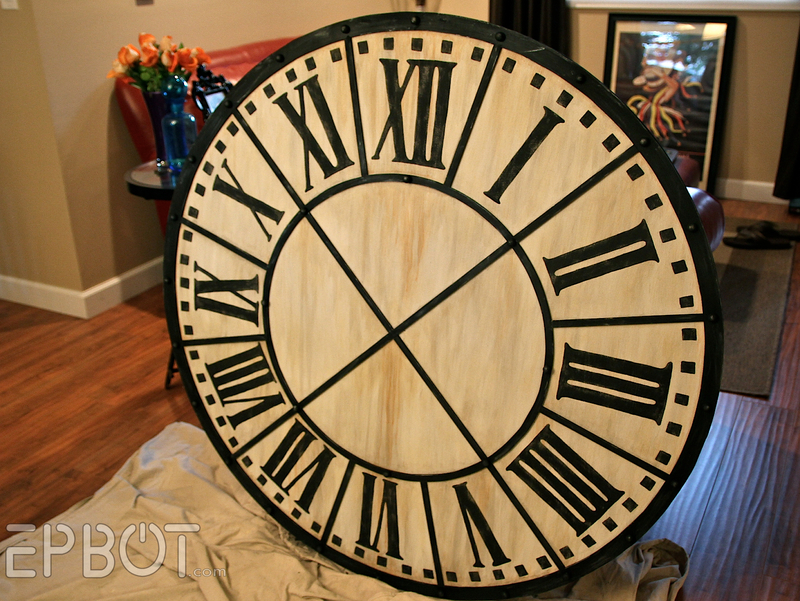 I have a giant clock in my family room, but your's is much cooler! I think we have been doing the same clock searches. I've been looking for a giant one since I spotted one in a house that was for sale. I was tempted to ask if they would sell us the clock instead. Love seeing these pics of everything you accomplished on your internet break! So very cool! You guys are super inspiration. 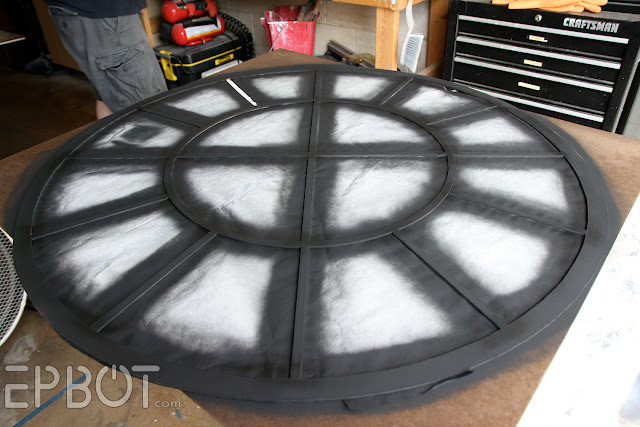 I spent all last week crafting and working on my NYCC cosplay, and I blame Epbot. :P I just wish I was as handy as you, or had a conveniently handy hubby like John! Jen, I know you like steam punk, so have you seen the Steam Punk coffee shop? Here's the link: http://www.retailhellunderground.com/my_weblog/2013/09/steam-punk-coffee-shop-in-south-africa.html. Too bad it's in South Africa. Wish we had one of those here in the US. 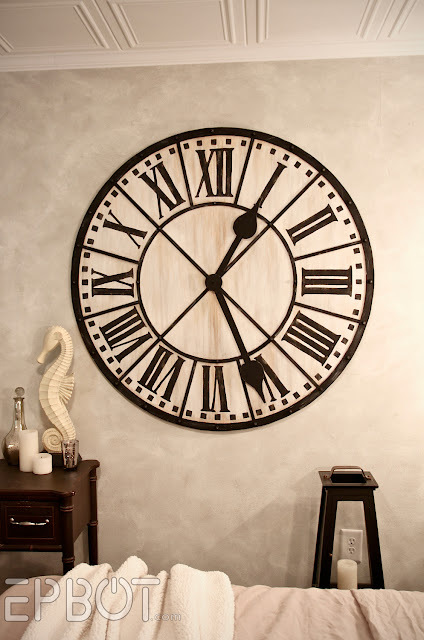 It looks fabulous - and if you ever tire of its placement on your bedroom wall, I've seen large clock faces hung on the ceiling over dining room tables. Very excellent! This post reminds me of this insane clocktower apartment in Brooklyn, NY. And for only $18M, it could be yours! I love your tutorials. You area always so good at showing each step! That is SO COOL!!! Fantastic job! I scored a used projector from ebay pretty cheap. Ahh, luv your DIY posts as always. I have too many windows and not enough bare in my home to put up a project like this. I've been wanting an analog clock in my living room, of course to help teach my littlest kids to tell time. I think I know what I'm going to do now. Now to figure out what weekend we are free. How have I not seen this post until now??? 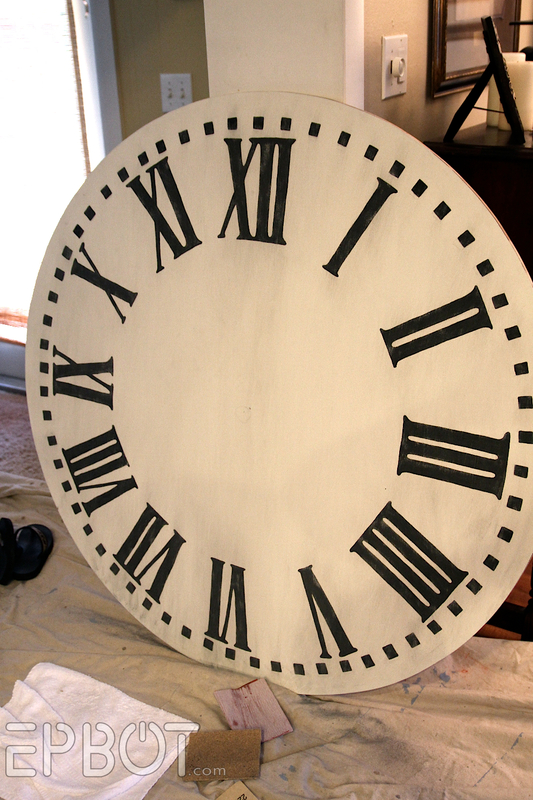 Thank you for the tutorial, I made a clock and took your advice and went bigger. It is now my favorite thing in my house thanks to you. 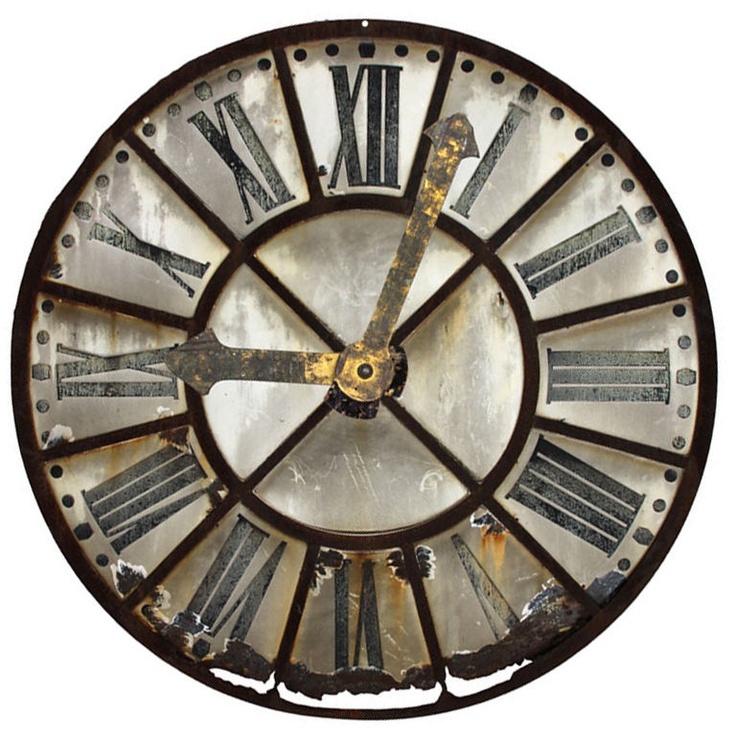 How would you have gone about making it a functional clock? D you think a craft store clock mechanism would do the trick? Would you have gone a different way? Why? Thanks. 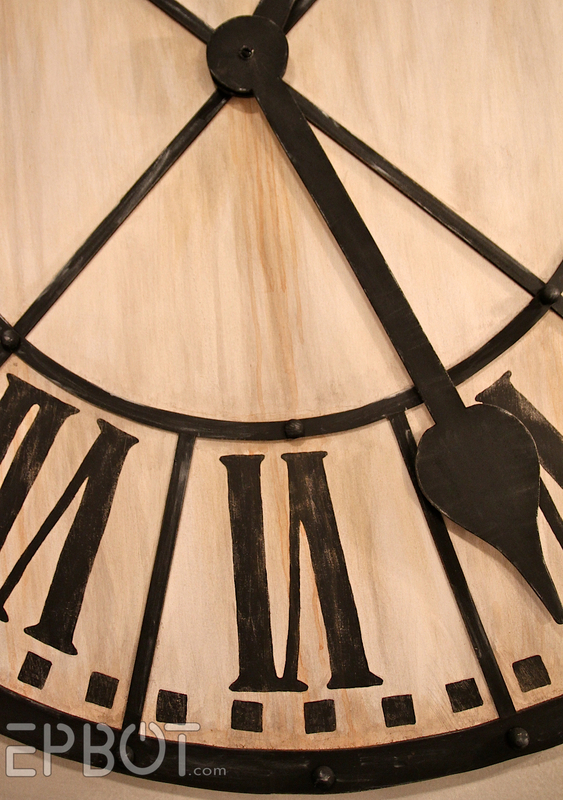 They sell clock kits in all sizes, so the only real trick is finding one strong enough to support the extra large clock hands. 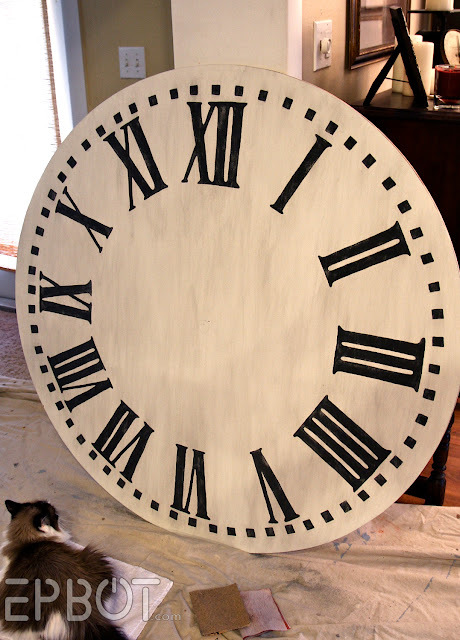 If I were to do it I'd make the hands out of something extremely light (balsa wood, rigid foam, or heavy cardstock), and then use the biggest clock mechanism I could find. 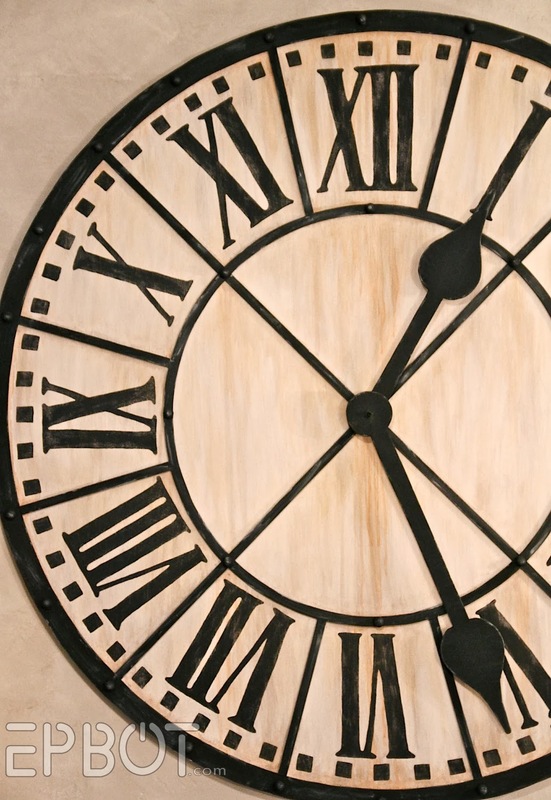 You might even try mounting one of those minimalist wall clocks that just have hands (like this) and extending or replacing the hands with paper or foam. What if... you put some sort of ring around the outside, maybe made of metal, and put a glass top on it. Set it on top of a round table and you would have a fantastic kitchen table. There is a furniture repair place not to far from here. I'm in need of a kitchen table. I'm going to take your plans with me! PS: I have a 48" wall clock very similar to what you created. And I'm currently researching Grandfather clocks. Is it possible to have a clock fedish? DOH! I am so angry. Read through this whole thing, was taking notes, and at the end the stupid thing doesn't even work! I want those 15 min of my life back!! Um... sorry? I guess? 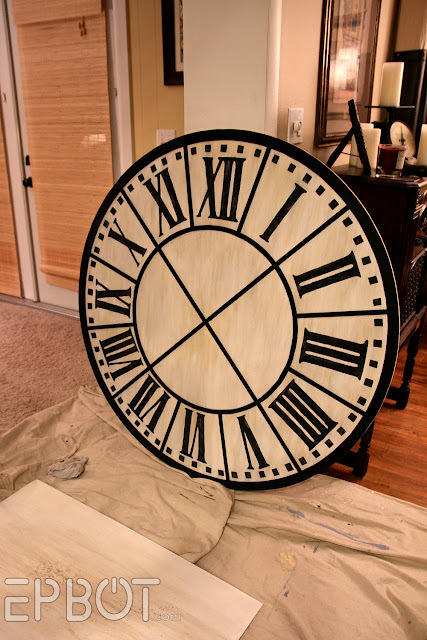 I mean, if you want it to function just add a heavy-duty clock mechanism in the back - it's literally one last easy step, provided you can find the right mechanism for this size. Clocks this size are almost never functional, though; they're meant to look like old Tower Clocks that have been dismantled. 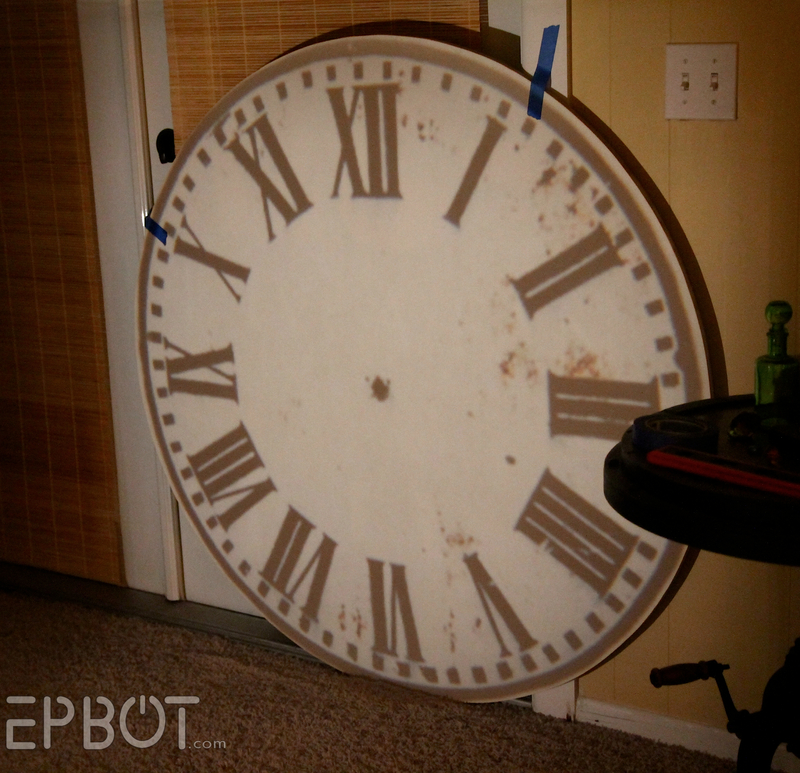 The largest *functioning* wall clock I've ever found was 30 inches, which is why we made our own to begin with.